Trek the wonderful Naar-Phu area and effortlessly help with conservation! Naar-Phu is wonderful trekking, and we revel in exploring the region, taking in the incredible gompas, the two stunningly set villages and also explore some high alpine valleys hoping to spot elusive wildlife. With our sound acclimatization plan and camping in remote spots, this is also a particularly photography-friendly trek. Although the trek will be a great no compromise trekking experience, it is with a purpose; is the Naar-Phu region suitable to become Nepal's first and probably main "alpine safari" destination? There are plenty of blue sheep and some predators in the region however that is only one of the fundamentals. As importantly, the community must be 100 percent in support of the concept, and this is what we aim to discover, and more. With the info we collect in this first foray, we will know whether this ambitious project should go ahead here. The more than I (Jamie) have researched, the more I understand how an innovative, comprehensive and holistic strategy is needed. There must be a big advantage, lasting real economic benefit for the locals. Then if they are better off conserving their region for tourism then it is a win-win situation. Conservation is a tricky balance, one where idealism quickly runs up against hard nosed economic reality, and political realities too. In short, while implementing policies is the job of dedicated experts, settling on the fundamental direction is perhaps the most consequential phase where innovative ideas can be explored but balanced by the real realities - and what is most needed is checking them on the ground. You help this meaningful trek because with each booking this enables us to bring along a researcher, with all their expenses paid instead of a trip profit. The trek is finely costed and won't make any money, and any difference will be borne by Project Himalaya as part of our dedication to the cause. No trek money goes to western staff wages or even flights over (we work for free and buy our own). The additional rewards on this trek will be sharing the trails and meals with knowedgeable and dedicated researchers, a satisfying cultural and knowledge exchange. Additionally, we'll hire local guides to introduce the village and their nearby grazing areas. What wildlife can we spot? Vultures and other large alpine birds, and I especially hope we can find signs and more of the predators: bear, marten, snow leopard, lynx, wolf and fox. Why waste acclimatization? After the Phu and Naar section, we exit via the high Kang La with its ultimate Annapurna panorama, and leaving the camping crew with the researchers, we continue in the good Annapurna Circuit teahouses, all the better to cope with the random spring weather. After a clean up in Braga, we take the side route to Tilicho, where Jamie had his first snow leopard encounter and then cross the Thorong La, where with a final neat Lupra village end, we finish in Jomsom. This second part of this trek is not entirely frivolous either, as Tilicho, especially, is a prime predator area and warrants understanding, and comparing although less formally. Short on time? Instead skip the Annapurna Circuit and take the quick way out with the researchers for a 21 day camping adventure. Join us for a particularly rewarding trek! We book additional nights at the hotel once we have your flight details. We introduce the key Kathmandu thinkers with the rest of the day free (and the office finishes the permits). Arrival this morning may be possible; do discuss. We start early for a long day's drive in a private bus with our crew, and let's see where we get to. We drive part or perhaps all the way to Koto, the gateway to Naar and Phu, and perhaps even trek - let's see. 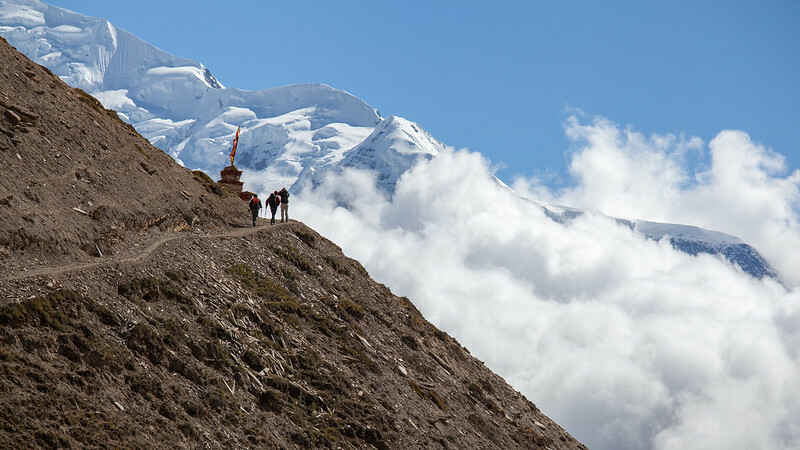 We leave the Annapurna Circuit and at last we are trekking! Today's trek day is short to allow for hiccups over the last day or two, for essential acclimatization to altitude and to discover wildlife in the forest and surrounds. A short but scenic day with essential acclimatization, again with time to explore around the camp, set in an abandoned Khampa (Tibetan resistance) camp-village. We have a meeting scheduled with the locals. Also once a Tibetan resistance camp, Kyang is now an almost deserted village. Lets see if we can find a way to spy the massive mountains above. The entrance gate, well below the village, offers impressive defence. We relax, visit the gompa and explore, perhaps above the village too. The researchers begin discussions with the locals and begin their research project. It is a short trek to camp and we can explore en route or after an early lunch. Exploring where predators are often seen, perhaps to Himlung Base Camp. Explore in the morning and return to Phu in the afternoon. We plan the standard trekking route however there is a tough conditions-dependent alternative. The group can split too. The researchers and local assistants will stay in Phu and surrounds for perhaps 3 weeks. Assuming conditions are good, we take the panoramic but high Kang La route back. After this crossing it is likely the kitchen crew will head back down, and we stay in lodges from this point, although this is a little dependent on our team size and other factors. A true relax and hot showers day in Tashi Ghale's wonderful lodge here. Kicho (lake) is an option. Our itinerary from this point is a good plan but has flexibility built in and can easily cope with surprise pre-monsoon weather. We have two days planned here. Jamie plans a simple 5000m sleepout at Tilicho lake using packed lodge food and a tarp or light tent, who fancies some suffering?! From Muktinath, there are jeeps to Jomsom however the Lupra route avoids roads. Or end in Pokhara if you want. Note that in 2019 Jomsom airport is scheduled to be closed for two weeks in March for a runway upgrade - I won't bet that it reopens on time for us to fly though. We may have to overland out to Pokhara. Better to leave sometime after lunch or in the evening, to allow for hiccups, or even better, perhaps tomorrow. Come camping around Naar and Phu and return from there, optionally still crossing the Kang La. The overall aim of Project Naar-Phu is to assist the local custodians to conserve their area by providing the economic means to do so. We are running this self-funding discovery trek to work out whether the people of Phu village are receptive to the idea of running innovative, alpine nature and wildlife safaris. Is the community a willing partner, and is the project viable? More details are better discussed privately at this stage. Do feel free to talk with me! "For me I look at this project as part of a holistic approach to conservation which involves science, community empowerment and stewardship, ecotourism and science communication through film making and broader public education. Its so wonderful to be working on this with people who also have this vision and passion....there's no limits to what we might be able to achieve." The name for the village of Nar is derived from blue sheep, called naur or nayaur. The generally used spelling is Nar however the Nepal government uses Naar and so that is its official name, and the spelling we use. Tibetan Diary: From Birth to Death and Beyond in a Himalayan Valley of Nepal by Geoff Childs - although he researched in Nubri, the cultural insights are relevant to all the Nepal high country cultures. This is a tentative list. Nepal's spring season — March-April-May — features quite variable weather in most areas, and sometimes significant haze (Asian brown cloud), especially in the middle hills. However, Upper Mustang and also to some extent Nar-Phu have significantly clearer skies and better weather since they are behind the main Himalayan range and above the ~3800m ceiling. Is the region very busy? Since trekkers to Naar-Phu must go through a company and the special permit adds $90-180 per person, this cools the number of trekkers, so while the Annapurna circuit is very busy, Naar-Phu is not. We are trekking Tilicho at the tail end of the season too. You must have a reasonable level of hiking fitness. Our trek has plenty of day trips where you can take it relatively easy - or extend yourself exploring. For the initial Naar-Phu section we trek standard Nepal expedition style, with you carrying a day pack, while porters (and mules?) carry the gear and we have a kitchen crew to cater for us. So, in some ways it is basically a standard camping trek, however trekking is our life and so we have our list of carefully thought out details such as the best quality jams and sauces, tent systems, fresh coffee etc, that make our trek service that bit more comfortable. For the second part, to Tilicho and over the Thorong La, we stay in the lodges while porters carry your kitbag. We take a water filter, medical kit and a few other luxuries to make our stay more comfortable. The Annapurna, Naar & Phu NP107 covers our trek although plenty of other locally available maps do too. Here are some photos from our classic 2010 trek which included Naar-Phu. Click the photo to go to Flickr or use the arrow keys to see them here within this page.